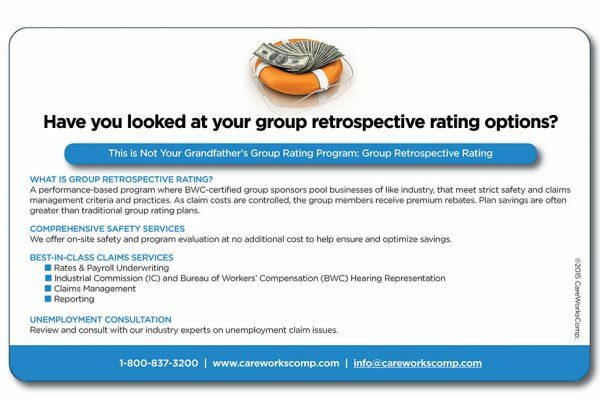 Each year Ohio employers have the opportunity to participate in BWC’s Group-Experience-Rating Program or Group-Retrospective-Rating Program. While these programs are not required, they do provide you with an opportunity to significantly reduce your workers’ compensation premiums, while increasing your awareness of safety and risk-management strategies. Workplace safety is an important component of these programs. To succeed in accident prevention, we encourage you to use the many resources available to you. We believe a group-rating program is a partnership that includes you and your employees, your sponsoring organization or third-party administrator (TPA) and BWC. Each has specific roles and responsibilities, all designed to assist in preventing workplace accidents. This letter outlines the safety services expectations you should have as an employer enrolled in a group-rating program.